I spend time tracking down long dead relatives I never knew and never will. I thought today that I should start writing down what I remember about some deceased relatives who I did know, so what I remember can be passed on. It is easy to forget. I decided to start with Grandma Herde. She was born Susie Elmira George. She was born in 1886 and died in 1973. I have seen her name wrong online as Susan. She did sometimes go by Susan because she thought it sounded more mature than Susie, but Susie was her legal name. I've also seen her death date listed incorrectly as 1969. I know for a fact it was 1973. She died when I was 8-years-old. 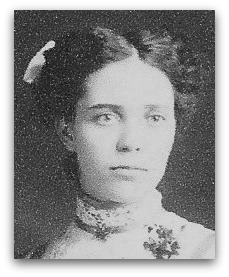 Unfortunately, I didn't get to see her very often, because we lived in Michigan and Grandma Herde lived in Billings Oklahoma. Now I know this won't be incredibly interesting. There aren't any twists or turns to this story, but I'll just be able to relate the things I remember from my time spent there as a young child. Actually I'm grateful I do remember something. Grandma Herde always impressed me as very neat and calm. She wore simple dresses with usually a full body type apron (or maybe that was because she always needed to be cooking when our large family descended on her house!) Her hair was always neat and clean. I always thought she was very pretty and she had kind blue eyes. I remember a cold green pea and cheese salad she made for us. I was a picky eater but I was surprised I liked this. It had a white sauce and the cheese was small cubes of cheddar (in case you ever want to try to recreate Grandma Herde's pea salad.) I have her recipe for Applesauce Cake (but I have never made it). I should. I really should. She had a wooden corner cabinet in the kitchen and especially in my younger years I liked to look inside it. I think they kept some toys and games in there. Probably Grandpa August Herde's dominoes. He liked dominoes. I also liked to go in the attic and play. I think the adults liked it because I was out of their hair for a bit. I liked the musty smell of it up there. Lots of really cool stuff. I like antiques a lot and maybe it's because it reminds me of Grandma's attic...I'm not sure. I found a black doll up there one time. I thought she was beautiful! I played with her and one day, Grandma said I could KEEP her! I was so happy. The doll was something I believe she made as part of a sewing group but I'm not sure. I still have it, although I played with her so much I don't think she's in the greatest condition anymore. The doll is made to cover a toaster. She has no lower half of her body, just a skirt, and that goes over the toaster. When the doll is set on the toaster, it looks like the doll is standing with a full skirt. I also have a miniature Christmas bell and a couple pieces of rhinestone jewelry (pins) that were Grandma Herde's. I am really grateful to have these physical remembrances of her and I do try to display them or use them whenever I can. I also have a few pieces of glassware that I like to use at holidays that were hers. I remember spending the night there and having trouble sleeping because of a fairly large sized cuckoo clock in the living room. Wooden (or plastic made to look like wood, I'm not sure) but it ticked very loudly and it had the huge weights that looked like pine cones -- the whole German look. I think a bird popped out during the day. Grandma Herde had decorative pillows that looked like large pills. They were small by today's standards I suppose. Some had crocheted covers on them, some were velvet. She lined them up on the back of the sofa. Probably to keep a little kid like me away from them. Early in the morning, I'd hear the neighbor's rooster crowing. Sometimes he'd crow at noon, or at 3 p.m. He didn't seem to care what time it was. I learned they are different from roosters in cartoons. I never did get to see the rooster, I just heard him. My grandparents lived on a dirt road. It was very boring at their house. Now that I am older, I would like to be there and be bored and enjoy some of that peace and quiet...I'd even enjoy the rooster. But not the cuckoo clock. Grandma Herde died in the hospital of a stroke, following a staph infection she got from cutting her finger on a can or something like that in her enclosed porch area.